I'm an er doc. I do not work a shift without this at my computer. It gets right to the point and doesn't beat around the bush and so works well for the ed. I am a Emergency Room Physician Assistant and I find that I use this book almost every day for reference. It has been well worth the money.Altho it is one of the less expensive texts I have run across. It is small and easy to carry around.Make sure to put your name on it or it will definitely grow legs and be adopted by someone else. Arrived on time. Exactly what I was after. Very comprehensive and provides just about enough knowledge you need. Great reference material! 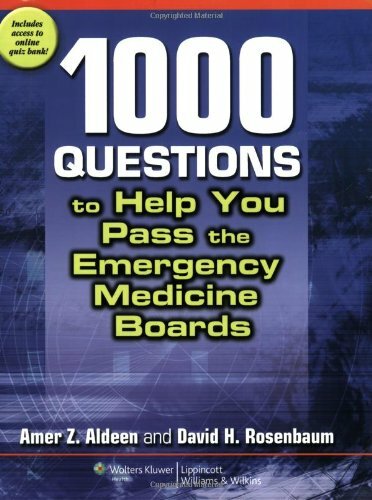 This review book contains 1,000 questions that mimic the in-service residency exam and board exam in emergency medicine. Questions are divided into 10 tests of 100 questions each, and each test covers all areas of emergency medicine: internal medicine and surgery specialty areas, dentistry, trauma, obstetrics, pediatrics, toxicology, environmental medicine, radiology, dermatology, EMS, and bioterrorism. Questions are case-based and 10% involve interpreting an image. Answers are included, along with concise explanations of the correct and incorrect answer choices. A companion Website presents cases, images, and questions that mimic the emergency medicine board exam and the in-service exam. Answers are included, along with concise explanations of the correct and incorrect answer choices, to help readers identify their strengths and weaknesses. I used this book along with Peer 7.It was great for the AOBEM.The questions are a bit specific but the answers are what to really focus on. This book is definitely not sufficient for board preparation in emergency medicine, but it deserves five stars no matter what.Even though the title mentions the EM boards, I think EM residents or med students doing Emed rotations would gain the most by starting these problems WAY early in their training.It's a more entertaining way to learn material than reading through a textbook, and the authors do a *really nice* job explaining the answers to each question. I've found several answer explanations to be quite high yield, b/c they usually have some discussion of why the wrong questions are wrong.Not only that, they sometimes will throw in extra "pearls" regarding the wrong answer.Example: A question about the correct treatment for otitis media explained the right answer of course.Then, even though antivirals is a wrong answer, the answer key discusses succinctly how herpes zoster presents clinically and that you would use antivirals for a herpes infection of the ear. I think this is a perfect review book. The questions are challenging and a great study guide. There is nothing else like this to review EM literature. This book is fabulous! I did pass my boards, but not because of this book.I used the NEMBR online course. This book was decent, but I wouldn't rely in it 100% or even 50% to help you pass your boards. I used this book for my 4th year medical school ER rotation. I was looking for a book that could fit into my pocket, similar to "pocket medicine" for IM but had a broad amount of material covered that was easy to review. Those that liked pocket medicine will like this book too! -Book has subjects listed as complaints with common findings, important history information, Physical exam findings, Lab findings and Management. Includes trauma and some critical care aspects. -Topics can be reviewed very quickly after seeing a patient. -It is better than pocket medicine, which is more for extensive work up of disease rather than ER management. -includes a very extensive reference section for easy topic look up. -Print is very small, around font size 6-8. It may strain the eyes for some. -For what is is worth it is expensive being ~$50 new. -The mini binder the book comes in does not have the book title printed on it. The image seen is a piece of paper that accompanies the book (you tape it on?). It just makes the book look like a date planner. Overall I thought the book was good and a worth purchasing. Some other students used the tintinalli mini book, but it was much larger and cumbersome to place in your pocket. I think this book is great probably for medical student and intern/2nd year ER residents. Im a PA and during my PA school I did a rotation in Trauma and Emergency Med at Mass Gen, where a lot of the writers of this book practice. I found that the information in this book was pretty much on point and provided a quick and general reference to a lot of the things you see in the ER. I studied this book and got all my pimp questions right! I purchased this book, and the ED loaned us the Tintinalli Manual.This book is great for quick references to help come up withthe best differential based on chief complaint.It is good for studying so you can focus on the most important issues with each major presentation.The Tintinalli is nice for reading to learn the info, but cannot be referenced as well while seeing patients. This book gets it right! The chapters are arranged based on chief complaint, which is how problems present in the ER. Within each chapter, a list of disorders that are potentially fatal and serious are offered, as well as the investigations required and management for each one. Unlike the Sabatine internal medicine book, this one is not cluttered nor ugly. The layout is crisp and organized, and everything is easy to find - given that it is an ER book, it should be since time is of the essence! However, this book is not perfect. The font is extremely small, like its internal medicine counterpart book. Furthermore, it does not have a great section on fractures and dislocations, particularly on their management. 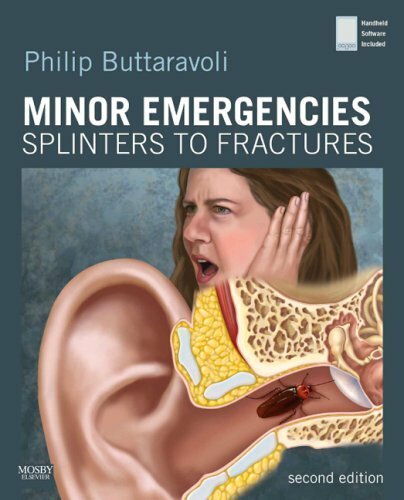 Overall, I recommend this book to anyone who practices in the ER. From students to seasoned veterans, this book will be useful for just about anyone. Very nice book to keep in your coat pocket. Lots of important facts that you need at your fingertips. I have recently read a few books on first responder type medical aid for wilderness scenarios ... and this is BY FAR the best.If you are looking for a book that goes well beyond even advanced first aid, and presents the material in a pratical way using common languge ... this book is it.There is a balance with books like this on either being too elementary (i.e. "dumbed-down") or being too academic (i.e. filled with technical jargon that goes over the head of most people), but this book is a great balance between the two.The author has a gift of explaining things in a very straight-forward fashion. The best guideout there. Period. As a Wilderness EMT and wilderness medicine instructor, I often find myself asking myself questions or being asked questions that I wouldhave otherwise never conjured up. Needless to say, I wouldn't carry this "bible of the backcountry" with me everywhere I go while out enjoying mother nature's splendor, but it certainly has its own spot in my emergency medicine library collection! Well written, easy to follow and understand, and the graphics are clear and concise. A great resource for any Wilderness First Aider, WFR or even WEMT! Very good how - to - book! This book covers anything and everything that could happen. Very detailed. I would highly recommend this book! This new edition is a standard handbook for anyone participating in outdoor activities or eco-tourism. 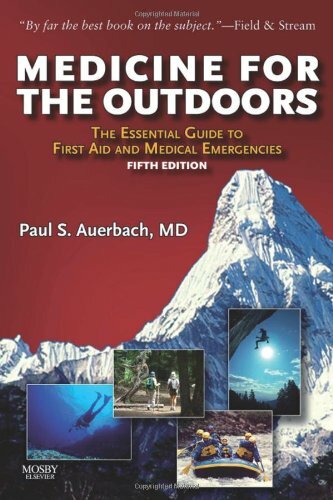 Dr. Auerbach is an emergency surgeon and authority in wilderness medicine. He maintains a superb website called "Outdoor Health" (link in the first Comment). Dr. Auerbach offers advice on both minor and major injuries, from shark and snake bites to lightning strikes, wound care, blister management and procedures for a being stranded by a snowstorm in your car. "One gives up very little (nothing, really) and gains everything by wearing a helmet in the appropriate circumstances. Freedom of choice is a selfish concept when one considers that the head-injured victim forces loved ones or society to provide care and the financial resources to manage the injury and rehabilitation, and sadly, support for the disabled person, who might have avoided most of the injury by wearing a helmet. "There is no excuse for not wearing a helmet approved for high risk (for head injury) situations. It is no different than wearing a seat belt in a car or washing your hands before you eat. Prevention is the name of the game. Having cared for many people with devastating head injuries, most of which would have been trivial or absent if a helmet had been worn, I can only hope that we do what it takes to mandate helmet use in every reasonable situation for which they would be of benefit. That is a necessary and appropriate use of the law." If you are only a weekend hiker like me, or take on more challenging pursuits, get to know Dr. Auerbach, either on his blog or better yet on this excellent guide. This is very useful for both novice and great review forprofessionals in medicine. 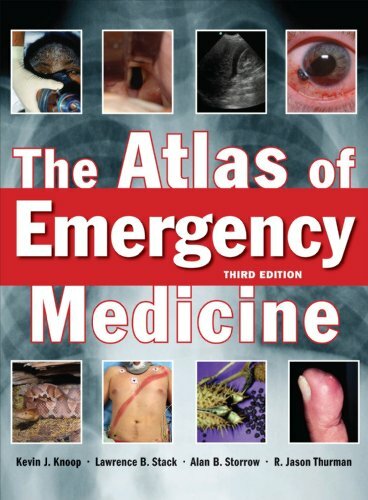 Ideally suited to the bedside practice of emergency medicine, The Atlas of Emergency Medicine is the ultimate visual guide to the diagnosis and treatment of common and uncommon conditions encountered in the Emergency Department. Filled with 1500 crisp, clear full-color images, this essential clinical companion is logically organized by organ system and then by problem, making it a practical quick reference for medical students, residents in training, new graduates preparing for their certification exam, the practicing physician, and instructors. The third edition of The Atlas of Emergency Medicine features an even more streamlined presentation with clear, concise text and an unmatched collection of diagnoses-speeding images. Forming the core of the book, these images show you what to look for and are accompanied by brief, high-yield descriptions of clinical problems. The new edition also features an enhanced template, and new coverage of airway emergencies, tropical conditions, toxicologic emergencies, and electrocardiographs. As an ER physician, this book is fantastic.The pictures are great and it provides just a quick blurb about treatment.It covers a very broad range of topics with beautiful color pics for all.I wish I would have bought this in residency. If you can read the super small font that is. Yeah, need good eyes for this little handy book. The previous edition had good information, but this one is even better.Pretty much covers all the facts and figures that I keep forgetting - and well-updated.After sampling multiple "pocketbooks" for EM, I think I'll stick with this one. This item has been very useful on the several occasions when I needed a quick reference for patient management issues, particularly for urgent ongoing diabetic care. Service of the purchace (pricing, delivery, integrity of product) were all at the usual excellent quality I've come to expect. Such a great reference. I have stopped using my PDA after I purchased it. I loved the 3E of this pocketbook, but it hadn't been updated for the new ACLS so I stopped using it. You need exposure to high-yield cases to excel on the emergency medicine clerkship and the shelf-exam. 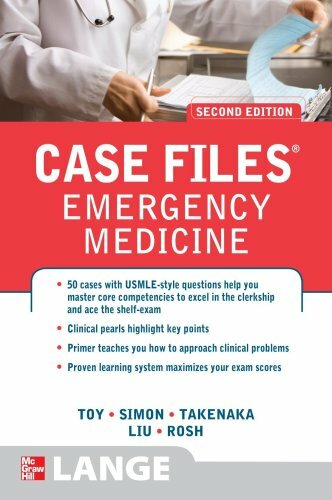 Case Files: Emergency Medicine presents 50 real-life cases that illustrate essential concepts in emergency medicine. Each case includes a complete discussion, clinical pearls, references, definitions of key terms, and USMLE-style review questions. With this system, you'll learn in the context of real patients, rather then merely memorize facts. Perfect book.Clinical vignette with explanations of correct answer and why the other choices are wrong.There are also review questions for each topic.Highly recommend.This is just about all I used during clinicals. 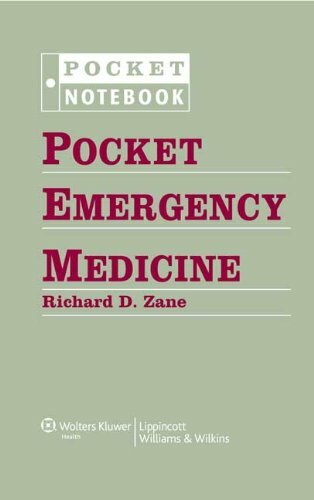 This book covers the essentials of the all the bread-and-butter emergency medicine cases in a manner perfect for easy learning.Don't waste time with other books, this book has everything a medical student could want for his/her rotation.Cases are short enough to read a few per night and are full of all the information to understand how to approach, work-up, and manage a EM patient.Almost invariably, I would be pimped on the exact information that was covered in the cases.The patients I saw were virtually identical to those in the cases.This series is wonderful for the medical student, especially the 3rd year. An "insider's guide" for success on the Emergency Medicine written board and in-service exams written by residents and junior faculty. First Aid for the Emergency Medicine Boards presents time-strapped emergency medicine residents (taking annual in-training exams or the end of residency board certification exam) and practitioners (renewing their certification) with a concise resource presenting quick, frequently tested, high-yield facts based on the most recently administered in-service and board exams.It is a complete review of emergency medicine topics tested on the written board exam.Approximately 125 clinical images and algorithms enhance the text.Margin notes reinforce key points.A chapter on preparing for the emergency medicine board exam provides helpful advice on scheduling study time, how to register for the exam, and what to expect on exam day. This review book was ok for reviewing some of the basics of the boards quickly and probably has most of what you need for the written boards. However, there are quite a few tables missing information from the Kindle version that I bought to read on my ipod touch such as toxicology tables. Given the price charged for the e-version, this is not acceptable. Unless it is fixed, would not recommend buying the electronic version. This book is ok. At 900 pages, it is too big and superficial to fit any niche on the bookshelf for really useful books. 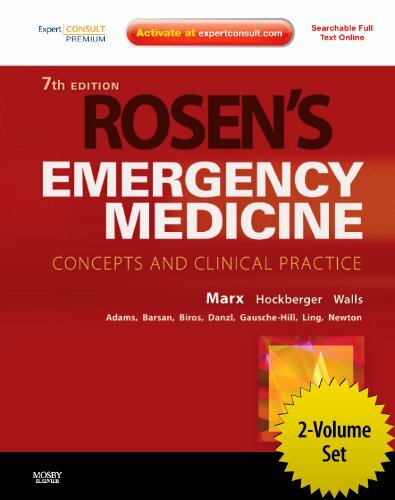 I've gone back to reading the new Rosen's, EB Medicine articles and lots of practice questions. After finding some mistakes and important topics covered too lightly, it hasn't left my bottom shelf. The other reviewer who mentioned this book simply regurgitating all of the common things you have already read about common emergency medicine problems was correct.It seems to rely more on "what everyone says" rather than pulling in any of the latest literature.This would perhaps be a good book for a medical student doing an emergency medicine clerkship as a quick reference about various topics.As an emergency medicine resident I find it too elementary, and reading the sections leaves me wanting more information even though I understand this is by its nature supposed to be a review book.I find that I rarely pull this off the shelf. For emergency physicians who desire a single, quick review for the ABEM board certification exam.930 pages of text - which take approximately 20 to 30 hours to review. Extremely terse, well organized and easy to digest.A clinical vignette Q&A begins most sections.Decent images / radiographs.High yield pearls are highlighted in the margins.Surprisingly up to date - the classic answers are provided with newer evidence-based info in parenthesis. Not for those who require a more in depth review, but for practicing EPs who only need a brush up on Leptospirosis, Foxglove, and the like, First Aid for the EM Boards is a reasonable approach. What is unique about the First Aid series is or I'd better say WAS concise rapid review with HY tips, now this is lost in their renewed editions. Organ systems sections reorganized to reflect considerations foractual clinical practice. It was delivered on time, as promised, and was a great new copy with fantastic packing materials and was brand new.The book is what it is, a freaking huge reference ER book.All in all a good buy.Thanks! If textbooks were judged by their weight, this one would be worth every penny of its purchase price.For better or worse, textbooks are judged by content and this one is lacking.The book itself is really a collection of articles on ER related topics from a variety of authors.The articles are repetitious, contain a lot of extraneous irrelevant information, and often conflict with one another.The antibiotic recommendations are hopelessly out of date.In general, a poorly written, poorly edited work which is a distant in the world of EM texts.Save your money. I am very appreciative of all of the work that went into this book.It is superb in many ways.I owned the 4th edition and I see many, many improvements, not just that the book is being updated, but expanded and made better.HOWEVER, I have one relatively big complaint.There may be some who, at appropriate times, will read through this book cover to cover, or chapter by chapter - however, for many, many of us, the book is used as a reference source.HENCE the INDEX is a key component of the book.And here, the book loses a full star (or maybe two) - the index is simply not comprehensive.Two examples - "Ciguatera poisioning" - I looked under "ciguatera" under "fish" under "toxin" and under "food poisoning" - could not find it.I know it is in the book - there is a table that includes it as one of the sources of vomiting, but where is it? [I found the information I needed on the CDC website!! ]Another example - "cecal volvulus" - looked under "volvulus" nothing.Under "cecum" - nothing. "Bowel obstruction" - nope. "Obstruction" nothing. "Small bowel obstruction" - finally found a reference in the index, but ultimately cannot find anything on cecal volvulus.I suspect that there MUST be something about volvulus in the Pediatric section on GI emergencies, but it should not be this hard, and I am not looking for a reference solely to children anyway.These are just two examples - I could offer many more.So, my humble suggestion - please work on the Index! !Isn't there a program that can do this relatively automatically - and painlessly?Information is great - quick ready access to that information is even better!Maybe I should just Google it? ;) Also, I have noticed some really lame illustrations - they look like mimeographed copies of copies - really hard to believe, especially since most of the illustrations are very high quality.In general I would like to see more illustrations within the text, particularly radiographic findings.The Color Atlas is kind of a joke, but there are many other sources for this kind of material. I would unequivocably recommend this book based on the number and strength of cases. Well-organized and with 109 cases. (The cases are harder than those presented in a review course. )I appreciated the citing of "pearls" and critical actions.Interesting appendices, as well. I did buy it via Kindle and was vaguely annoyed by picture quality and inability to quickly "flip" back and forth. Just took the oral boards and found this book extremely helpful in my preparation. 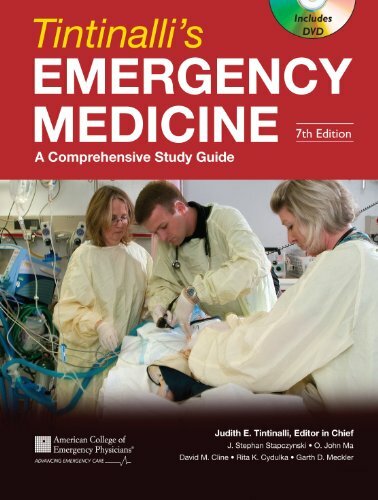 Studying with this book works great when you're together with fellow EM trainees, but it's also fine with non-EM folks or even for reviewing by yourself. Each case has an area where the critical actions are well defined, but also a nice summary of emergency disease management little pearls about each topic. If you go through this book, you'll be extremely prepared and a lot more comfortable about the real exam. 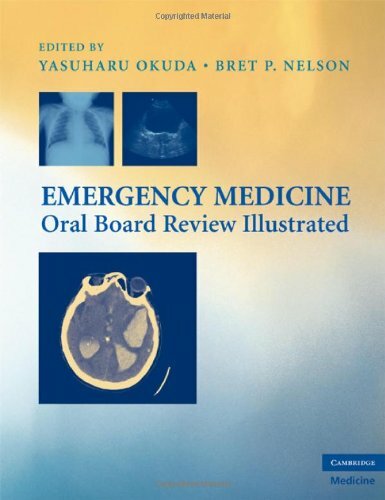 I studied with friends for the EM boards using both this book and another leading EM boards book, Emergency Medicine Oral Board Review: Pearls of Wisdom, and I felt that this book was far superior to the other, which advocates outdated information and has far fewer cases. (As an FYI, it seems that there are rumors that ABEM wants you to do non-evidence based things on the boards.Not true. )The other book supports that notion (ie -- you must hyperventilate all head trauma.Ugh.How 1992! ).This one does not, and the authors actually reference the evidence for their conclusions at times. This book has the most cases by far (> 100), but there are no triples.That is easily solved by, well, just having a friend give you three cases together.It is not a big deal at all.The cases are all classic EM, the kind of cases you should be practicing for the boards.No zebras, no off-the-wall scenarios, which is just like the real boards. There is a small appendix of high yield information on peds, trauma, tox, procedures, and ACLS.Very useful.The appendix is smaller than in the other book, but it appeared to me to be more high-yield. There are quite a few typos and a few factual medical errors, but they are mostly minor and/or obvious.Fairly typical for a first edition. Drs. Okuda and Nelson have done an excellent job in compiling this oral board review. This text is a unique one, in that it addresses key issues in preparing for the Emergency Medicine Oral Board Exam. It helps to organize your thought process, by going through > 100 classic cases. It also allows you to practice for the exam by going through cases with a colleague. Coverage of each disorder includes clinical presentation, pre-hospital, diagnosis, treatment, disposition, and ICD-10 coding. Icons enable practitioners to quickly spot the information they need. This edition provides up-to-date information on topics such as emerging infections, new protocols, and new treatments. This Third Edition is also available electronically for handheld computers. Great book. Each section appears to be written by leaders in the field. Very concise. Figure out how to handle a particular pt. in 5 mins or less. i love the format! its just-enough, in-depth-enough, quick-look, quick review, its just that its not really portable, and also will need a revised edition soon - and i'm the first to get one! On a dollar for dollar basis this is the best ER text for practical use IN THE DEPARTMENT during a busy ER shift.The layout of the book, 1 diagnosis per 2 pages (every diagnosis fits nicely on the left and right hand pages of the opened text).It quickly highlights the presentation of illness with signs and symptoms, the necessary workup (labs, x-rays, additional studies) and recommended dispositions (admit vs discharge).It WILL NOT give you an in depth discussion of the disease process, you must make the diagnosis,but it rapidly allows you to get your essential workup started. good quick reference book.layout is open and easy to read but lacking the details.needs to read up more like uptodate or emedicine.if you have a PDA, getting the pda version would be nicer than the book version as it is too big & heavy. my items were brought to me in time interval as previously prescribed in amazon.com .thanks for that. But i don't like the submission of my package. My package was left at the entrance of my apartment, so someone could take it easily. Please submit to my books directly to me, don't leave it somewhere else. This is to pediatric emergency medicine what Nelson's is to general pediatrics. This is the book. The bible. The source. Easy to read. Lots of tables and algorithms. Based on the acclaimed Manhattan Review Course and drawing on valuable insights from top New York City emergency departments, this review has everything you need to pass the Emergency Medicine written boards on your very first try. Here, you'll, get a concise walk-through of key emergency medicine topics, board-format Q&A, and a full-color image review with cases on CD -- all designed to give you a solid idea of what to expect on exam day. 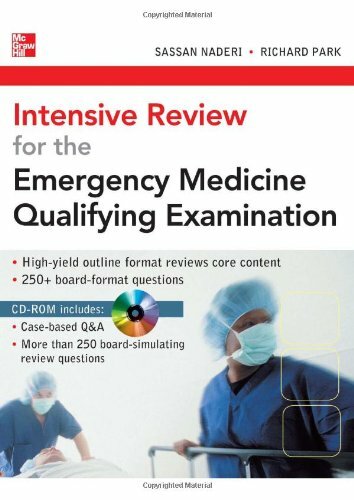 Intensive Review for the Emergency Medicine Qualifying Examination features a succinct outline format, yet it leaves nothing out, covering the full range of emergency medicine specialties. It all adds up to the ultimate board study companion -- one that can help you recall information pertinent to the practice of emergency medicine and approach the exam with confidence. An essential quick reference for the office, the hospital, or anywhere, this book provides all the instructions you need to handle common, non-life-threatening emergencies with speed and expertise. Whether you're called on to remove a bean from a child's nose or treat accidental tear gas exposure, this quick reference is ready to provide fast, efficient guidance just when you need it. Find guidance at a glance with "What to Do" and "What NOT to Do" checklists. Get comprehensive coverage that remains concise for emergency point of care. Stay on top of the latest emergency strategies with new coverage of: croup, nasal vestibulitis, heat illness, chiggers, acute bronchitis and simple pediatric sedation. Download content from the book onto your PDA for rapid access anytime, anywhere! Must have for everyone family physician (ER docs probably don't need it) who starts working in an urgent care. Great book for family med or urgent care. When I did some moonlighting for urgent care clinics, the long-term urgent care docs were amazed with this book. Well written. Would def buy again. I'm just starting in urgent care and this has proven to be a great resource. It has many helpful tips not found in other sources. I highly recommend it--it's very practical! Great Urgent Care/Family Med Reference! Fantastic review with great illustrations & step by step management.I'm a family practice resident interested in urgent care as well and this book is fairly conclusive for both of those topics in terms of "walk-through-the-door" complaints. Fantastic do's & don'ts for each syndrome/injury with Pt. instructions and background info on each in case you've forgotten anything from med school. The only thing missing, I would say, is a template procedural consent form and some web links related to each topic that may be useful.However, I'm really stretching for something wrong. Great book for any physician dealing with minor procedures! The Secrets SeriesÂ® is breaking new ground again. 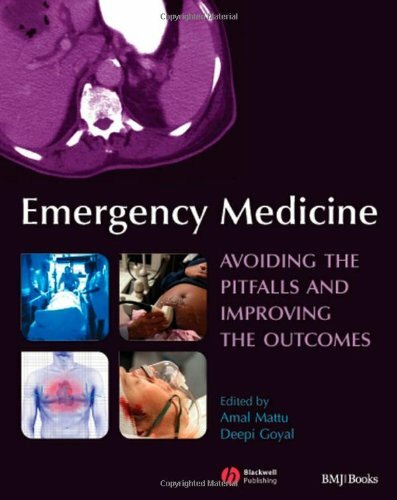 This updated and expanded edition will cover all aspects of emergency medicine. 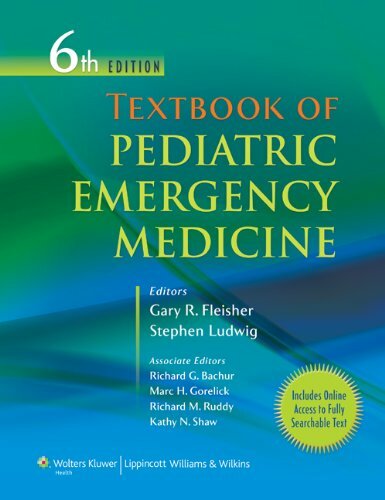 Sections include decision making in emergency medicine, primary complaints, nontraumatic illness, central nervous system, respiratory system, cardiovascular system, gastrointestinal tract, genitourinary tract, hematology/oncology, metabolism and endocrinology, infectious disease, environmental emergencies, neonatal and childhood disorders, toxicologic emergencies, gynecology and obstetrics, trauma, behavioral emergencies, emergency medicine administration and risk management, and medical oversight and disaster management. 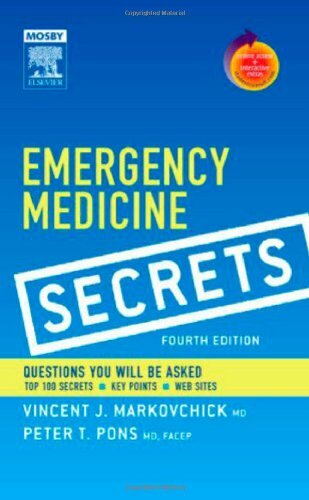 A new, two-color page layout, a more portable size, and a list of the "Top 100 Secrets" in emergency medicine help readers to better meet the challenges they face today. And, at no extra charge, purchasers also receive online access to the complete contents of the text via Elsevier's innovative STUDENTConsult.com website. Readers will still find all of the features they rely on the Secret SeriesÂ® for-a question- and -answer format, lists, mnemonics, and tables and an informal tone that make reference fast and easy. No matter what questions arise this updated 4th edition has the answers-in print and online. Access to the complete text and illustrations of this book. Content clipping for your handheld. An interactive community center with a wealth of additional resources. The more STUDENT CONSULT titles you buy, the more resources you can access online!Look for the STUDENT CONSULT logo on your favorite Elsevier textbooks! Short, bulleted chapters make for easy reference, but it is also interesting enough to just plough straight through. Definitely appreciate it as a brand new practitioner. 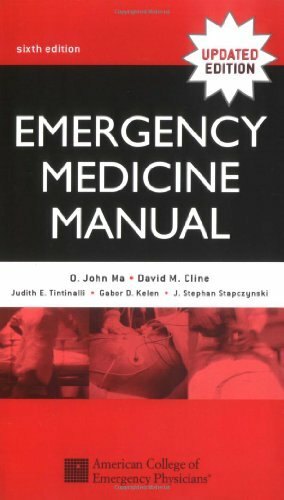 This book is a great guide for medical students who want to go into emergency medicine, it is short enough to read in a month but long enough to cover a lot.I recommend reading it before or during your fourth year emergency rotation and again between the end of fourth year and the beginning of your intern year.Carry it with you as a reference. (Purchased on 05/01/2008) Have wanted this book for some time and found it cheapest at Amazon. This book is well layed out and organized by disease process and symptoms, good to have on hand for quick reference (but don't leave it lying around the ER, it will disapear fast). Easy read.I would recomend for med students/residents or ER nurses. When I started work in an emergency department this book gave me many tips to solve some difficult cases. It is written in a way you can read it for few minutes in between patient visits in your night shift. The readability is high and you never get bored because it fixes every question in few lines (maximum 20 but mostly less than 10). 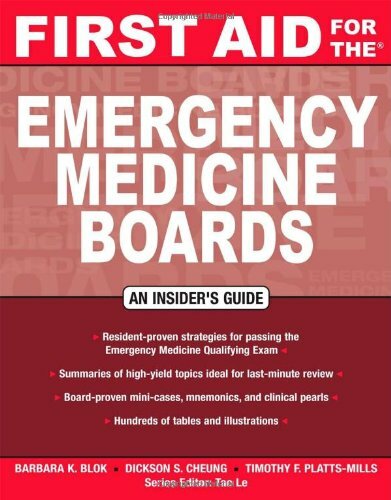 The best study guide for emergency medicine board exams! This rapid, comprehensive review of emergency medicine succinctly covers all the information needed for emergency medicine board exam success or as a clinical refresher. Featuring a bulleted format, this valuable guide includes only the most important facts as well as test-taking tips and strategies. 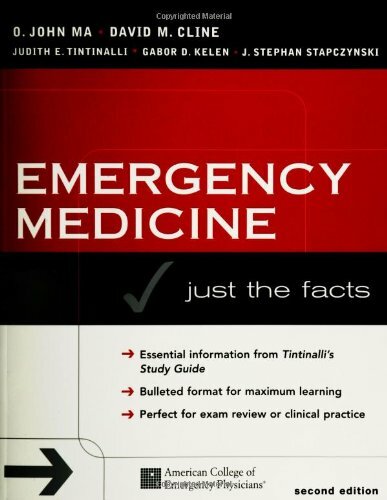 Referenced to the new edition Tintinalli's Emergency Medicine, 6/e. One of the few ED review books I've liked. I found the right amount of detail that suited me. Took me a fortnight to go through. I reckon it would be a great review for non- ED docs during their ED rotations . Overall, Five Stars! "Patients older than 40 years are unlikely to have rotator cuff tears." I am not so sure about this, it doesn't make sense really. Searching in the big T book, I find "Patients with rotator cuff tears are almost always older than 40 years of age: rotator cuff tears in the young are rare."!!!!!! I used this review book to study for my recert exam (ConCert) on Nov 3'07.I went back to the book immediately after the exam and found ~95% or more of the answers to the questions that were on the exam.If you are worried about detail - use tintinalli (and take a year to prepare! )This review book does not get into great detail, but neither did the exam! Most info is upto date (except recommend cipro for GC and no mention of MRSA).If you give yourself 2 months, you can easily cover the 600+ pages.there are no questions and no pics/stimulus type items.I would highly recommend this review book for the recertifying exam, and have so to the other attendings in my ED.i don't think i would recommend this to residents. Great book. Not just for emergency medicine but for medicine in general. I highly recommend this book. 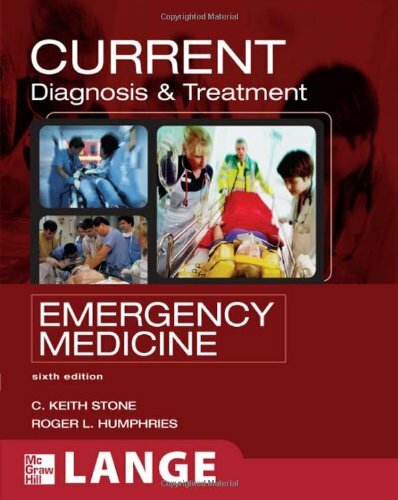 This read is not only sufficient for students and professionals alike, but remains as a solid material for review for any exam.It provides one with the basic clinical knowledge that is required of one who practices in an ED, or similar type of setting.The only pitfall is that there is limited detail regarding syndromes and illnesses.Still a great read and review. In an emergency, you only have one chance...and usually very little time...to make the right decision. 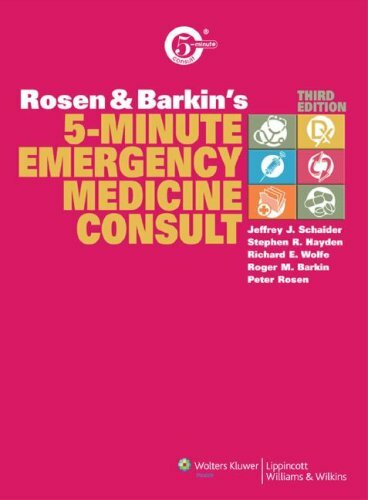 How can you be certain you have the knowledge you need?Through six editions, Rosen's Emergency Medicine has set the standard in emergency medicine, offering unparalleled comprehensiveness, clarity, and authority. Now, the seventh edition places the latest knowledge at your fingertips, while a more streamlined format makes it easy to find the exact information you seek more rapidly and conveniently than ever before. Best of all, this resource includes access to a companion website where you will find the full text of the book, regular updates, reference links to MEDLINE, and more. Presents more than 1,200 exquisite color illustrations that accurately capture the real-life appearance of patient symptoms and diagnostic imaging findings, helping you to reach a definitive diagnosis more easily. Includes "Cardinal Presentations" sections that provide quick and easy guidance on differential diagnosis and directed testing. Includes access to the complete contents online at expertconsult.com, fully searchable, as well as reference links to Medline, regular updates reflecting critical new clinical findings and recommendations, and a question-and-answer review section with over 1100 questions that enables you to brush up on key information in a quick and convenient manner. Presents greatly expanded coverage of emergency ultrasound and emergency gynecological disorders, along with sweeping updates throughout, to place the latest knowledge at your fingertips, as well as state-of-the-art coverage of emergency ultrasound, management of sepsis, new airway devices, updated protocols for adult and pediatric cardiac arrest, STEMI and NSTEMI/ACS, DVT and PTE, and much, much more. Features a streamlined format (now two volumes instead of three) that focuses on the most need-to-know information so you can find answers more quickly. Without A Doubt , The Bible Or Emergency Medicine .. Although Using A Smaller Font , Its The Best And The Toxicology Part Is Better Now ,In Short A Must Have !! This book is a great read compared to any other text out there for EM. It is long but the time invested in learning and reading it worth-while. Here as before, the authors have brought Emergency Medicine to a new height.This book, like the last two editions, revamps the subject in a form that is readable, and to the point without the superfluous "fluff" seen in other books. It comes in two volumes (instead of the three like prior editions).On-line access is a definite plus when I am at work and can't haul around a big fat textbook.I can search for things on my computer. I totally recommend it.It is one of my 'must haves' in my armamentarium of EM. No complaints. I purchased the book not the CD.Pleased with online access, as internet is available everywhere. This is far better than Harwood and Nuss for completeness of content. So many of the chapters there have leave information out. No CD, just a "Pin Card"
The essential problem-oriented guide to all diseases and conditions that present to the emergency department -- now updated and expanded! Good book with all the basics, but a little bit smaller than I expected. The advanced cardiac life support pharmacotherapy summary information on the inside of the front and back covers is really useful. 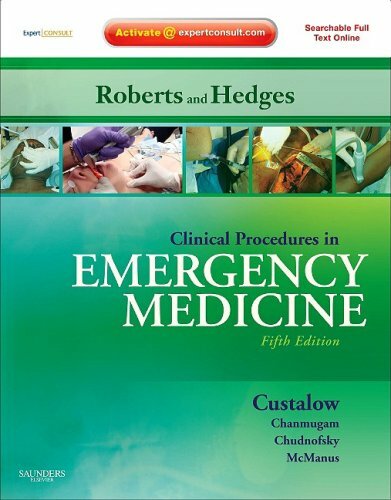 Clinical Procedures in Emergency Medicine, by James R. Roberts, MD & Jerris R. Hedges, MD, MS, is far and away the most well-known and trusted procedures manual in emergency medicine. Completely updated with the latest equipment, devices, drug therapies, and techniques, this 5th edition enables you to make optimal use of today's best options. A new full-color format makes the book easier to consult than ever before, and online access at expertconsult.com lets you rapidly reference the complete contents from any computer. Online and in print, you'll see exactly how and when to perform every type of emergency procedure, so you can choose and implement the best possible approach for every patient! Provides over 1,700 detailed illustrations, 1,350 in full color, allowing you to visualize procedures clearly so you can perform them correctly. Explains not only how to perform each rocedure but also why, when, and what other procedures you should consider. Covers the latest equipment, devices, drug therapies, and techniques, including new devices for cricothyrotomy, monitoring CPR effectiveness, intraosseous infusion, autotransfusion and transfusion therapy, and wound closure. Incorporates coverage of ultrasound-guided procedures throughout the book to assist you in the use of these increasingly pervasive new techniques. Presents a new chapter on Chemical and Physical Restraints to facilitate management of violent or aggressive patients. Features a brand new full-color design together with all-new algorithms, illustrations, and tables for expedited reference and streamlined clinical decision making. Reflects the most recent clinical evidence and guidelines for dependable decision-making guidance. Includes online access via Expert Consult, allowing you to rapidly reference the book's complete contents from any computer. A perfect source for quick answers in your challenging, fast-paced field! Offers updated coverage of tracheal intubation and infectious exposure management, so you can make spilt-second decisions on these difficult procedures. This is an excellent book.As an ER resident, I have found this book to be invaluable in helping me to understand the procedures that I am trying to learn.This text also does more than just explain how to do the procedures; it also gives plenty of background on the underlying disease processes, the indications for the procedure, etc. 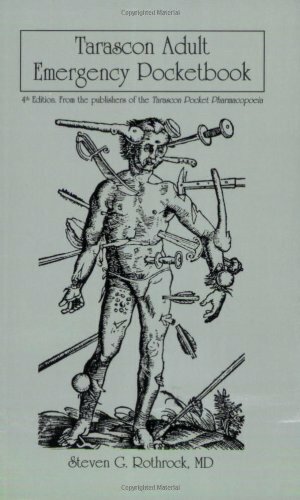 I would also mention that, even though this text is geared toward ER...I think any physician who performs a wide variety of procedures from suturing to intubating to IV access to chest tubes may find this book to be quite useful.Would definitely recommend this book and refer to it quite often myself. As an ER PA I find this large text full of many procedures useful in emergency medicine. However, by todays standards the B&W pictures and drawings are very dated. An alternative worth considering; with better pictures and detailed descriptions would be: Emergency Medicine Procedures by Eric Reichman and Robert Simon.